Communication is a holistic phenomena. When you listen to speech, you consider the motives, interests, and abilities of the speaker in pursuing the resulting goals. You ask yourself why someone is saying something the way that they are saying it. Are you saying I’m stupid? This is one of those things that trips me up every so often, especially in one-to-one conversations. When we are in a group, it’s easy to understand that disagreement can be seen as an affront; conversely, it can be difficult to remember that people take badly to disagreement in private conversation as well. Is it interesting to you too? Topics inevitably drift over the course of a conversation, and picking up cues and allowing the topic to change in the right direction is also important, lest what one considers a profound line of thought is taken by the other to be irrelevant inanity. I imagine religious aphorisms to be a stark example of this – I believe there are people out there for whom the ability to conclude a conversation to a biblical quotation or some other aphorism is profound, whereas such is somewhat inane to me. Addressing all these facets can be done by adopting the style of classic prose. Classic prose is a simplifying construct which manages to compartmentalize conversational causes and to clarify what would otherwise be an even more impressionistic exercise. It’s a construct that prioritizes simplicity and clarity over all else. The role is severely limited because classic prose is pure, fearless, cool, and relentless. It asks no quarter and gives no quarter to anyone, including the writer. While the role can be necessary, true, and useful, as well as wonderfully thrilling, it can hardly be permanent. For better or worse, human beings are not pure, fearless, cool, or relentless, even if we may find it convenient for certain purposes to pretend that we are. The human condition does not, in general, allow the degree of autonomy and certainty that the classic writer pretends to have. It does not sustain the classic writer’s claim to disinterested expression of unconditional truth. It does not allow the writer indefinitely to maintain the posture required by classic style. But classic style simply does not acknowledge the human condition. The insouciance required to ignore what everyone knows and to carry the reader along in this style cannot be maintained very long, and the masters of the style always know its limits. The classic distance is a sprint. What if your tax rate was lower? Well, I would probably get more post-tax income. For every dollar less of taxes, would you get one dollar of additional post-tax income? No, because I might get a lower salary. What if the government dictated that rent in my area was not to increase more than 1% a year? My rent would probably be cheaper than rent in other areas. Well, not if the house falls into disrepair because the landlord find it not worthwhile to maintain the property after a few years. What if the government raised taxes on companies? Companies will pay more taxes. Well, things might get pricier too, as those new costs are passed on. Cross-elasticity is a very broad phenomena. Any profit-generating activity that involves multiple inputs and outputs has many ways of adjusting those inputs and outputs to maximize value (be it profit or consumption), and when prices are changed for one input or output it will affect the demand / supply of the other inputs and outputs in some way that can be difficult to anticipate. To assume that the only change would be in the adjusted input / output is naive. I’ve now completed 21 days of consecutive blog posts! Frequency will be reduced going forward, hopefully meaning I will be able to write longer pieces. I have a friend who organizes board game night every few weeks (thanks LCH), and I try to attend whenever I can. Most of the time I find that game instructions often sound intractable but are in fact not all that difficult to get comfortable with if you forge ahead and just go through the motions. Unlike computer games, there is nothing that guarantees that you are in fact playing a board game correctly. People learn to apply a set of correctness checks to the game – it can’t be that the first mover always wins, it can’t be that certain pieces are always ignored, and it can’t be that losing a small part of the game means you would never catch up. Whenever a game seems bad, the first thing that occurs is always that you’ve read the manual wrongly, and the response to that is to figure out some way to play differently so that the problem does not occur. I’ve always found good social games to contain an equalizing dynamic, where those who are behind are provided with certain advantages that help them to catch up, whereas those that are ahead have to be wary of defending their lead. This is related to the fact that games differ greatly in the shape of their learning curves – in games like Go, with very steep learning curves, the chances of a novice beating an expert are pretty much zero, and there is pretty much no equalizer built in. It’s obvious that homes in Singapore are smaller than those in the US and many other parts of the world. Why is this so? What percent of Singaporean household income is spent on housing? How regressive is this? How do we account for purchases using retirement funds (CPF)? How does the demand curve for living space depend on household size and demographic group? Do school districts have an observable influence? What about expat areas? What proportion of the cost of an apartment due to the land? How linear is the dependency between apartment value and apartment size? How much cheaper are apartments with longer commutes? How big is the effect of regulatory limits on living space to land ratios? Does it make sense for the government to manage house prices because of their role as household collateral in a fractional reserve system? Are there significant interactions with monetary policy? How much monopoly profit does the local building industry enjoy? I am currently reading Approximate Dynamic Programming by Warren Powell. The book comes out of work that Powell did with Schneider National, a company that operates a large fleet of trucks in the US. I haven’t gone very far in the book, but it definitely seems very promising. The central premise that I can grasp is that it is fruitful to consider the quality of a model strictly in light of the decisions that the model is being used to make. This can be contrasted with typical surrogates like the root mean squared error or mutual information – those measures for model quality are largely derived using definitions of convergence towards total knowledge, and attempting to reach the state of total knowledge is often futile in reality. In building practical models with practical approximations, choices in the early steps of an analysis often contain implicit knowledge about what the output from those steps is to be used for. To carry this process to its logical conclusion would be what I imagine approximate dynamic programming accomplishes – this way of dealing with ignorance trades off uncertainties in such way as to minimize the impact they have on decision quality, as measured by what you actually care about for the specific problem. I think that this is an excellent structure for the people who are networking – i.e., when the product is yourself. How would you sell yourself if you were going to follow these steps? 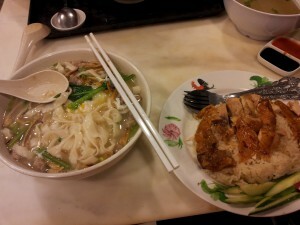 I could eat either ban mian (left) or chicken rice (right) every day and not get tired of it. I don’t know if this is merely because I grew up in Singapore, or something special about this food. What makes a food, or a person, have a high fatigue point? Mere familiarity and agreement, or something more? I greatly enjoy talking to people who ask good questions. The best way to learn something is to teach it, and largely this is due to the possibility of you teaching someone who doesn’t know what you do but is able to ask really good questions nonetheless. The better a question is, the more it helps to organize the underlying corpus of data, and help to turn a body of facts into knowledge. The person who is in actual possession of the facts isn’t the best person to synthesize it, simply because there is too much hindsight bias – if you have known something for too long, you lose the ability to differentiate the simple from the complex, and when you are unable to shun complex analyses in favor of simple ones you lose your sense of direction when engaging in critical reductionist analysis. On the other hand, if you are able to, through interacting with someone intelligent but ignorant about the specific topic, communicate the entirety of your knowledge in a pithy way, then you know that you really do get it.